Dr.Explain is a handy help authoring tool for creating context sensitive help files in CHM format. The program allows assigning the numerical Help ID values and text aliases to each help topic and then export them at once into the output CHM file. Many programming environments, such as MS Visual Studio or Delphi, support Help ID mechanism. 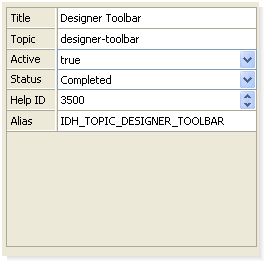 During designing, you can specify Help ID in properties of your GUI elements: dialogs, buttons, lists, options, and other controls and after compilation your program will be able to show the appropriate help topic for every GUI element that has a Help ID value assigned.